V1421. HAROLD WAYNE, Vol. X, incl. 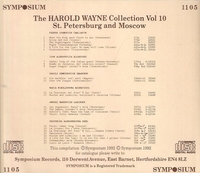 Alchevsky (3), Chaliapin (6), Kuznetsova (2), Labinsky (4), Orel (8) & Sharonov (2).� (England) Symposium 1105, recorded 1902-03.��Final Sealed Copy!